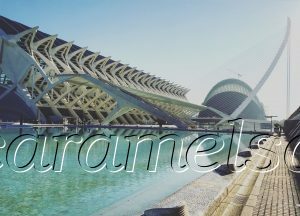 At one end of the former riverbed of the Turia, is  The City of Arts and Sciences Complex. It’s a spectacular display of modern architecture. One that would make any city proud. And one that would also make a city very indebted after some gross misspending. But it’s a walk not to be missed in Valencia. 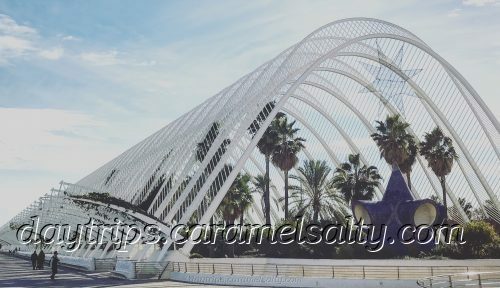 The architect who creates this complex is Santiago Calatrava. His first fantastic structure is the  L’Hemisferic (1998). It’s a giant eyelid. Which opens to access the pool surrounding it. Which floats on a shallow glass bottom. Which in turn creates mesmerizing reflections and ripples. If only Calatrava had made the pool 4 feet deep, what an infinity pool it would have made. Another 2 feet, and voila, we’d have the longest Olympic pool ever. 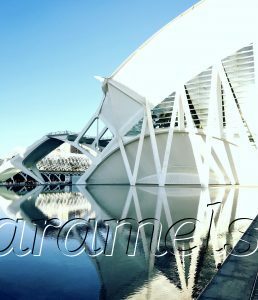 Which would have gone some way in making the building resembling a skeleton of a whale, the  El Museu de les Ciéncies Principe Felipe (2000), feel more at home. L’ Umbracale (2001) is a landscaped garden at road level, with outdoor sculptures and indigenous plant species. 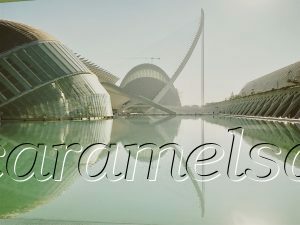 Calatrava is heavily influenced by Gaudi. So it’s no surprise to find a white, crazy-mosaic bench running alongside it. Unfortunately, some of Calatrava’s ideas have been scuppered by the relentless summer heat. Shady creepers growing over the red-hot iron frame of the L’Umbracle is a non starter. 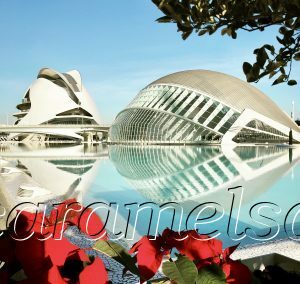 However, the  L’Oceanografic (2003) and the futuristic looking  Palau de les Arts Reina Sofia (2005) are more successful. Standing tall and proud in the sky is an elegant curved white pylon. This single pylon and its 29 parallel cables is all it takes to hold up the  Assut de l’Or Bridge (2008). Locals also refer to it as the Harp Bridge or the Ham Holder. For obvious reasons. Before I immerse myself in Valencia’s riverbed, there’s a pagan ritual of fire to discover first. 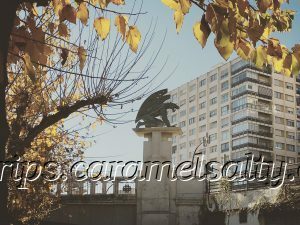 Valencia is known for its centuries old Fallas festival (more about it here). The highlight of the festival is the 700 fallas which appear all over the city. Tall as a building, sat on cardboard boxes filled with fireworks, they are all set alight on the last night. One figurine, or ninot, is pardoned each year. And I find these at the  Fallas Museum. 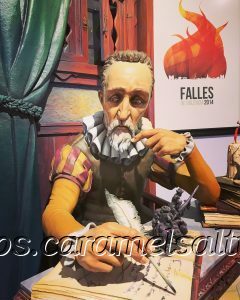 The workmanship of these fallas is on par with Madame Tussaud’s. 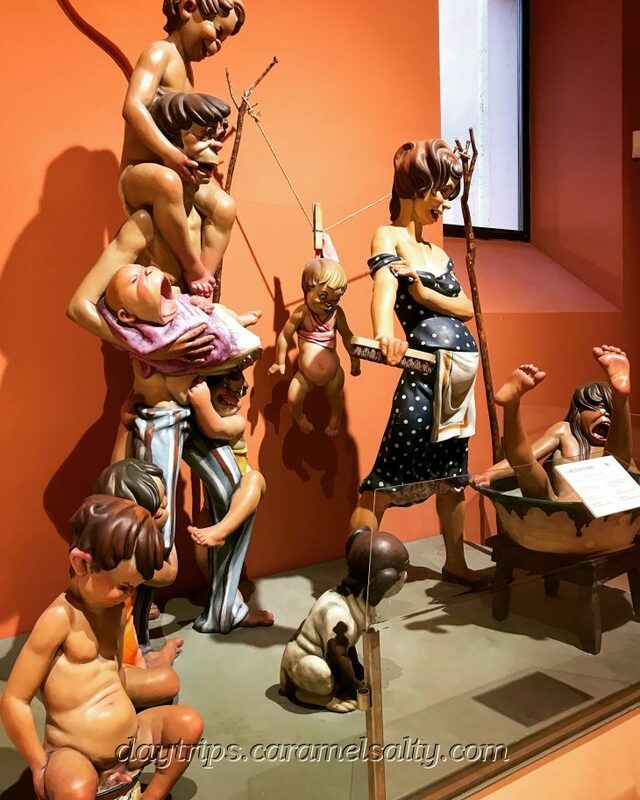 The symbol of figurines comes from another old European culture where dolls of personas non gratas are hung from posts, before being burnt on a fire. Which is why the fallas are often satirical digs at celebrities and politicians. 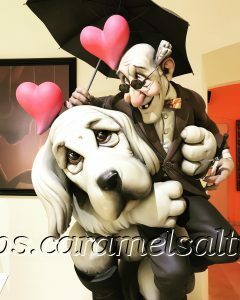 The fallas is a great insight into the Valencian sense of humour. Many of them are risqué, sexist and cheeky. Also playful, imaginative and amusing. Perhaps not quite what the 15th century Christians had in mind when they persuade the pagans to convert their spring equinox festival to a feast for St Joseph, patron saint of carpenters. 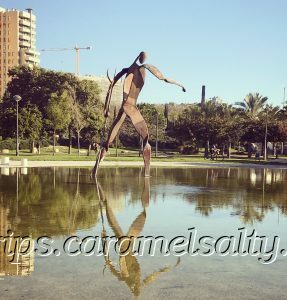 Now its time to dive into the  Garden of Turia. Into the sunken river bed of the River Turia I go. As a Londoner, and in the month of December, I’m thrilled to be able to wander amongst roses in bloom, green fronds of palm trees and colourful bougainvillea. But where is the River of Turia? It has been diverted south. 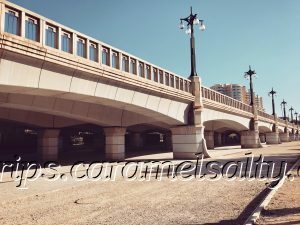 It now runs along the Autovia-V-30 motorway. It’s new home resembles a wide monsoon drain, over which my train to Xativa the other day, crosses over. As a result, it leaves behind a 9 km dry river bed. One that the city transforms into a green strip. Why was the river diverted ? Because it used to flood at least once every 10 years. The last straw is the Great Flood of Valencia (1957) when, officially, 81 people died. The Spanish dictator Franco flies in to see the devastation. And by 1969, a river no longer flows through the city. 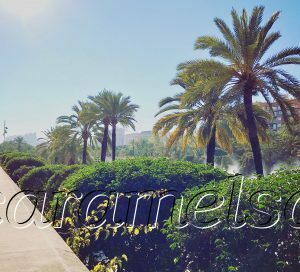 In the wide trench of the Garden of Turia, a bare foot jogger runs past me. Groups of school children deposit their sweaters and satchels in a pile. And then proceed to run around in wild abandonment by the rectangular pool of the  Palau de La Musica. Playgrounds, parks, cycle paths are enjoyed by the locals in this temperate weather. A painting of the medieval city and river at the Town Hall, shows that the river is nothing like the perennial fast flowing Thames of London. More often than not, it is half empty, with large puddles. But when it rains in Spain, especially on the plains, the volume suddenly rises to a dangerous torrent. Winding my way, just like the river once did, 10 feet below the drone of the traffic, I get a river’s eye view of Valencia. 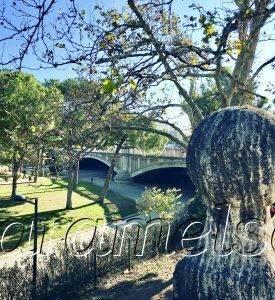 Of gargoyles guarding bridges, beautiful buildings beyond the ancient river wall and the arches of some fine old bridges which still traverse the dry bed. The most spectacular of the bridges is the  Pont de la Mer, or the Bridges of the Americas. It alludes to the deep connection between Spain and South America. Just like every other pretty bridge along the way, it’s worth clambering up to admire the stone balustrades and statues. 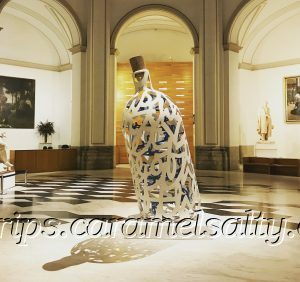 Eventually, I flow pass by one of the most beautiful museums in Valencia, the  Museum of Fine Arts. 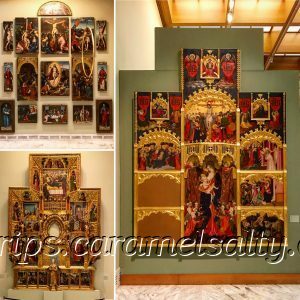 It’s the second largest gallery in Spain, filled with 15th century to 19th century art. And contains rooms dedicated to local artists, like Sorolla. I am not really a die-hard fan of church altar pieces. But, oh my goodness. The first gallery I walk into is full of the grandest, most elaborate, beautifully painted, gilded altar pieces I have ever seen. One piece even has a 3D balcony. I am now converted !! After a lovely 45 minutes in the museum, I head over  Pont de La Trinitat, back to my digs in the heart of the old city. 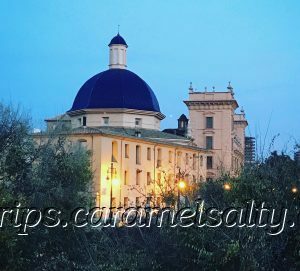 I look back at the beautiful blue domed Museum of Fine Arts, as the sun sets on another grand day out in Valencia. 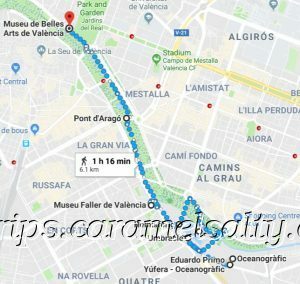 Bus 95 – Get off at the Eduardo Primo Yúfara – Oceanográfic Bus Stop and walk back to the City along the Garden of Turia to cover all the sights above. 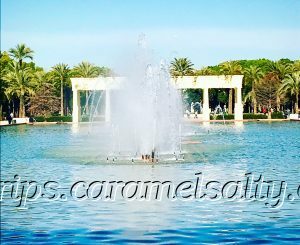 L’Hemisferic (website), Museu de Les Ciencies Principe Felip (website) Oceanográfic (website) – Open daily. 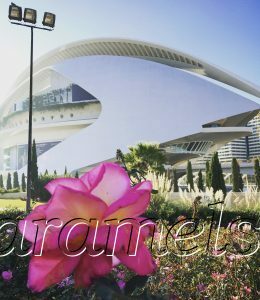 Combined discounted tickets for L’Hemisferic, Oceanográfic and Museu de Les Ciencies can be purchased from any of the sites. Garden of Turia and points of interest (map here). Open 24*7. Avoid at dark. 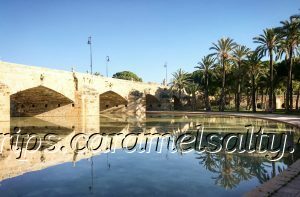 Museu de Belles Arts de Valencia (Spanish website) – Closed Monday. Open till 20:00. Free.